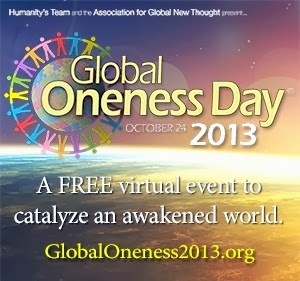 The 4th annual Global Oneness Day on October 24th, 2013! Join thousands around the world in this online summit to explore the profound realization that we are one! Register today for this inspiring, one-of-a-kind event. Beautiful and inspiring speakers in the Global Oneness Day Telesummit also include: H.H. Pujya Swami Chidanand, Sadhvi Bhagawati, Pujya Sri Sri Ravi Shankarji, Rev. Michael Bernard Beckwith, Ken Wilber, Barbara Marx Hubbard, Joan Borysenko, Neale Donald Walsch, Don Miguel Ruiz, Panache Desai, Ervin Laszlo, Rickie Byars Beckwith, Gregg Braden, Jean Houston, Bruce Lipton, Doug Bentley, Gangaji, Fr. Thomas Keating, Lynne McTaggart, Riane Eisler, Craig Hamilton, Steve Farrell, Barbara Fields, Paul H. Ray, Ph.D, Peter Kater, Steve Bhaerman, Howard Caesar, Claire Zammit, Rinaldo Brutoco, Roger Teel, John Raatz and Anna-Mari Pieterse.